Radok Scene of the slime: Part of 4.7 million gallon spill came from this location off Johnston Rd. As used condoms and the raw sewage sludge they arrived in continue to pile up behind David and Olivia McManus' home on Lansbury Court, the list of people Charlotte-Mecklenburg Utilities (CMU) neglected to tell about the millions of gallons of sewage it spilled of late is growing longer and more shocking.Neighborhood parents weren't the only folks CMU didn't bother to warn about the mammoth spill of raw human sewage (enough to fill 18 Olympic-size swimming pools, if you can handle that disturbing image) that spewed from a manhole behind a backyard on Lansbury Court off Johnston Road. The agency, which is run by the City of Charlotte, didn't bother to tell county water quality personnel charged with assessing environmental damage caused by the spill, either. Land Use and Environmental Services Water Quality Program Manager Rusty Rozzelle said he first learned details of the extent and location of the 4.7 million gallon spill when he read an article about it in last week's Creative Loafing. "That 4.7 million gallon one that occurred, we found out about it a week after it started," said Rozzelle. "It happened on the 23rd and we didn't find out about it until the 29th. By that time, it was gone, you know. The report was really so late that we were unable to assess it. We're very upset about it and very concerned about the number of spills that have occurred and the amount of spillage that has occurred." Rozzelle said that CMU hasn't been informing his agency of spills in a timely fashion for several weeks. During that period, heavy rains have caused dozens of spills. CMU is not legally required to report spills immediately to the county water quality program, although until recently, that had been standard practice, which allowed the county to investigate the spills for environmental damage on a timely basis. CMU did not respond by our deadline to our requests for an explanation of the long delay in informing the county and state about the massive spill. State law requires that polluters inform the local news media when spills over 1,000 gallons occur. CMU initially informed the media by press release that 1.3 million gallons had spilled into a 10-foot wide stretch of McAlpine Creek on May 23. Although the spill continued for another five days, CMU didn't inform anyone that the spill had grown to 4.7 million gallons until May 30, two days after it finally stopped. 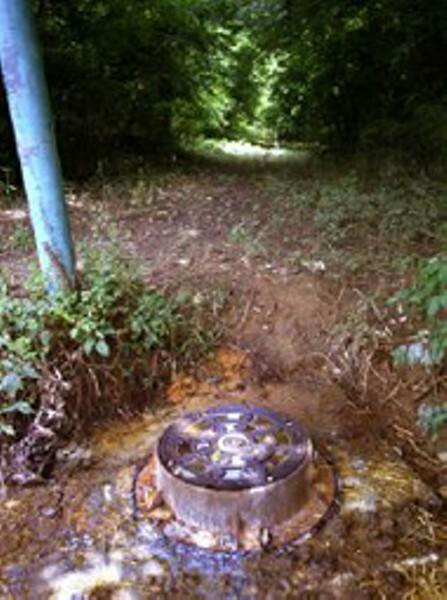 CMU also neglected to inform county water quality program personnel -- or neighborhood residents, for that matter -- about two other spills from the same manhole the weekend of June 6-9 totaling 486,000 gallons until days after they occurred, once again effectively blocking the county from assessing environmental damage that could have led to fines from the state. That is, if the state ever actually fined CMU. "We just don't have time. . ."
North Carolina Division of Water Quality Environmental Regional Supervisor Rex Gleason said CMU also neglected to inform his agency that the May 23 spill had continued for five days. According to an agreement between the county and the state Division of Water Quality (DWQ), county environmental assessors are authorized to respond to sewer spills in Mecklenburg County. Spill reports and environmental assessments by the county are then forwarded to the state agency, which is then supposed to analyze them and, if warranted, recommend a fine. The county water quality program plays a crucial role in the environmental enforcement process since the state rarely sends anyone to investigate sewage spills. State enforcement officials haven't fined CMU for a spill in recent memory despite the millions of gallons of raw sewage it has spilled in recent years, even when the conditions of the spills meet the state's own criteria for a fine. In contrast, the state has regularly slapped large fines on businesses and farmers for smaller spills across the state and in Mecklenburg County, sometimes as small as a few thousand gallons. But the NC Division of Water Quality and the NC Department of Environment and Natural Resources appear to have turned their heads while CMU spilled millions of gallons of raw sewage over the last six years. State environmental regional supervisor Rex Gleason was vague and nonchalant when asked about the latest round of spills by CMU. Gleason, who has held his position for over two decades, said he wasn't sure what the 17-year-old agreement between Mecklenburg County and his office says or whether it even addresses sewer spills, essentially the same response CL has gotten from Gleason every time we've called him for comment over the last two years. CL's efforts to explain to Gleason what the agreement (which his office renews every two years) says have proved futile. One thing, though, is clear. Gleason doesn't appear to be overly concerned about the sewage spills his office is supposed to be monitoring. "We just don't have time to go out and investigate all the spills that get reported," said Gleason. "As a matter of fact, we go out and inspect very few of them." Richard Bridgeman, an employee of Gleason's, pointed out that their agreement with the county doesn't mandate that CMU tell the county when there's been a sewer spill. The problem with this situation is obvious: if the county doesn't investigate spills because CMU doesn't tell them about them, and the state doesn't send anyone to investigate them, then CMU is largely left to police itself. Frustrated sources within the county's water quality program department say the problem doesn't end there. They say that, like CMU, Gleason's office and other state enforcement officials who are supposed to be regulating CMU haven't been forthcoming in keeping them informed about CMU's sewage travails either. According to these sources, spill reports sent to the state by the county water quality people "may or may not even get looked at," virtually assuring that CMU will go without a fine time and time again. They also say that despite the agreement between the two agencies, the state "never calls them about anything." Lansbury Court residents finally learned about the full extent of the spill when Creative Loafing interviewed them on June 6. They noted that children had played in the 100-foot area where the spill occurred between the manhole and McAlpine Creek in the days after the crews working on the spill finally left. Last year, after criticism that it kept residents in the dark about sewage spills into neighborhood creeks where children play, CMU unveiled a door hanger program that was supposed to be used to inform nearby neighbors that a large spill had occurred nearby. At the time, CMU said it would set no guidelines about when it would use the hangers, but would leave it up to CMU utility crews who respond to the spills to decide when to use them. CMU spokesperson Cam Coley said last week that the utility didn't leave door hangers on residents' doors after the massive Lansbury Court spill because "the overflow happened in a wooded area and not where there are houses immediately adjacent to the pipe." But the map of the spill location Coley gave CL showed that the spill occurred less than 150 feet from the McManuses' home on Lansbury Court. 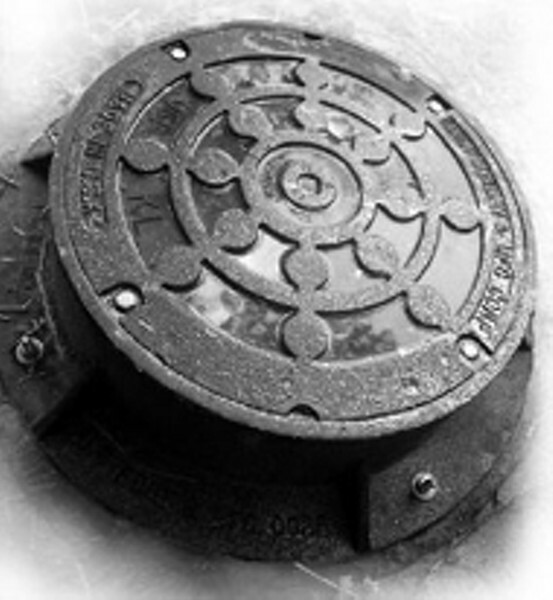 The McManuses say that the overflow from the manhole settled in a three to four foot deep sludge pool, about an acre in size, of standing, stagnant water that covers the area between the creek and the manhole. On June 6, six days after the spill had officially ended, the area around the stagnant pool still reeked of sewage. Creative Loafing first raised the issue of sewage spills in Mecklenburg County after an investigation revealed that over 12 million gallons of raw sewage was spilled into the waters of Mecklenburg County between 1999 and 2001 in 815 separate incidents. Many of the larger spills wound up in creeks and streams in subdivisions or residential areas where children at play might come in contact with them. Despite the repeat nature of several large spills from the same pump station areas, North Carolina Department of Environment and Natural Resources (NCDENR) has yet to recommend a fine in any of these incidents.